The very best of what's coming in February. It’s a new year and a new month and you all know what that means: a fresh haul from our favorite Swedish retailer. Yes, Ikea just released word of their upcoming collection and it’s going to be a good one. Colorfully charged and complete with the signature minimalist aesthetic we all know and love, the new line boasts no shortage of inspired finds. Built with the intention of making the everyday more playful, February’s product offering embodies the vibrant with a focus on simplicity and detail. Among the extensive line of furnishings and decorative accessories, are an array of items geared towards helping you make the most of your space. Chic storage solutions come at aplenty and there are no shortage of colorful prints and patterns. Read on for a peek at the items we’re most excited to shop. A set of nesting tables at such a low price point is pretty hard to come by, especially for a trio as chic and streamlined as this. We love the versatility of this one—use it as an extra long coffee table or cluster the set to double as a side table—and the fact that the smallest table features a taller edge, allowing it to function as a shallow drawer of sorts. Now that’s clever. Sleek, streamlined, and beautifully detailed—I mean, we really wouldn’t expect anything less from Ikea—the Hallan series is comprised of two variously-sized cabinets, which can either be stacked atop one another or set individually on a pair of matching legs offered via the line. Both sturdy and durable, the metal-made cabinets can function as a solid storage solution for just about every room of the home. It’s time your bathroom got that long overdue and well-deserved revamp. And a colorful detail is definitely one way to go about it. 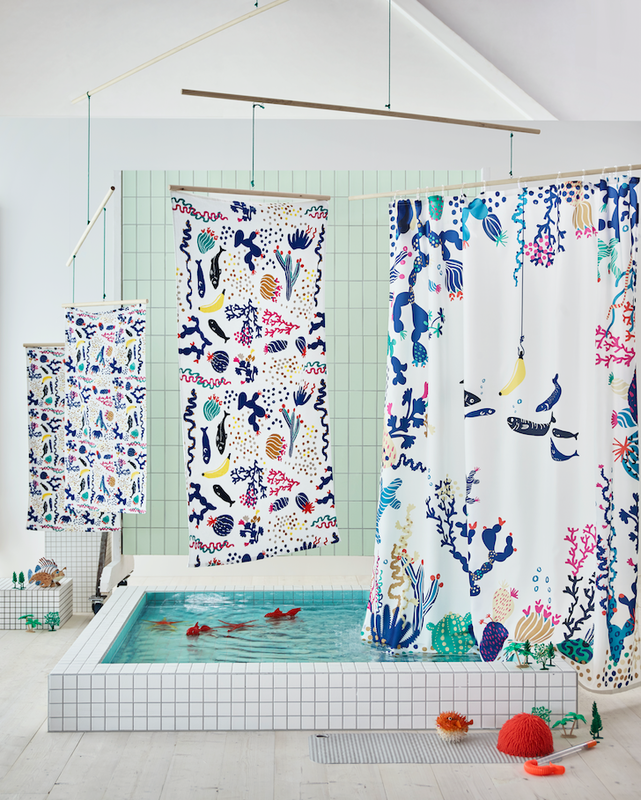 The line includes ultra absorbent cotton towels, crafted from sustainable sources, and a water-repellent shower curtain, all bearing the same vibrant maritime pattern designed by Paulin Machado. Why stop with the towels? Take things a step further—hey, if this turns into a mini makeover, we’re all for it—by tackling the lesser acknowledged elements of the bathroom. And if you ask us, the shower is definitely an ideal starting point. Enter Ikea’s newest range of shower accessories that will help you do just that. Featuring thermostatic faucets, and multi-spray and hand-held shower heads, the line offers a mix of modern and traditional designs all encompassing the brand’s reliable style. Available in three color ways ( black, red and white with birch), the Burvik side table provides a much-needed refresh on the typical rendition of the classic living room staple. Its innovative design features a top handle built in with the intention of allowing the piece to be easily moved about a room. Crafted of lacquered wood veneer and a powder-coated steel frame, the table features an elevated edge to prevent items from sliding off. Talk about statement lighting. No longer do you have to drop half your monthly salary on a style-focused lighting fixture. Nope, Ikea is here to save the day with this wooden veneer-based pendant that exudes pure elegance and effortless style. Channeling a traditional Swedish design aesthetic, the turbine-esque effect of the lamp will impart your space with both a unique detail and a beautifully ambient effect. Minimalism never looked so good. Less is clearly more when it comes to the Panorera series, which gives a household staple a beautifully understated revamp. The ultra affordable line rings in less than $20, and features a slew of eclectic alternatives, each more sleek and mod than the other. Crafted of stainless steel, some of the clocks even come with an LED light that illuminates the piece. We’re definitely not passing up on this one. Ikea has seriously stepped up their collection geared towards the little ones, and the Klammig series is no exception. Featuring an array of brightly-colored essentials—towels, duvet covers, blankets, and even mats—the sustainable items are a must for the nursery. Ikea’s new collection will be available online and in stores in February 2018.